The hybrid concept is now a mainstream technology across a swathe of sectors and not least in construction plants. As manufacturers scrabble to conform to ever tighter legislative emissions requirements it is fast becoming a prerequisite in many applications, and the designers of gensets are powering up to make the switch. Pramac’ s contribution was recently on show at the Executive Hire Show and is a demonstration of just how far the hybrid has come. Of course, lower noise, reduced CO2 and fuel consumption are guiding principles of this class of product, but where this unit stands apart is that it has been designed as a hybrid from the drawing board and beyond. Rather than bringing disparate elements together in an uneasy alliance, the Stage IIIA Yanmar diesel engine, AGM battery pack and inverter in the CombHy P18000 hybrid gen set have each been designed to work in harmony on a specific welfare cabin application, with the added bonus of 1.8kWp of solar input. Indeed, the product has emerged from the R&D department following eight months of development, and 100 hours of testing. The size to weight ratio has been carefully considered, service intervals have been increased and maintenance access improved. Not only that but, with one OEM covering all components, and Pramac itself supplying training and warranty support, hirers can have confidence in a hybrid as a reliable solution, and will have the knowledge to make it work for their business. In addition, the scope and capacity of battery packs is evolving at a pace, and that means manufacturers can now drop the size of the engines without any less of performance for the end user. Because it is only using the power required for that application there’s no issues with oversizing and, by using the power accumulated in the batteries, the genset is not running with low loads. 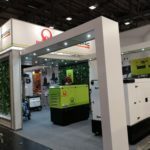 Pramac-Generac UK is a business that is itself on the move with the two companies merging operations in early 2018. That relationship has been further reinforced with the relocation to a central site in Staffordshire, replacing its dual facilities in Milton Keynes and Crewe. The 21,000 sq ft premises, positioned close to the M6, will include increased space for its expanding service, parts, administration, sales and marketing teams, and there are further ambitions product launches planned for the years ahead.